I've dabbled in car audio but nothing serious. When I adopted my dad's 67 Chevelle wagon roughly 15 years ago, I found out the amp he put in it in the early 90s was an old school HiFonics 4ch - either a Europa or Jupiter VII (it's been a few years since I even looked at it). That thing is still bada$$. He just bought what the guy recommended when he added a Sony CD player that was pre-amp only. He ran it into 4 Pioneer 6.5" 2-ways. It's been through 3 head units now and the 3rd is acting up. I also re-wired it with better power wires and running it 3ch (1&2 into the doors, 3&4 bridged into an ancient 8" Bazooka tube). Still running the ancient Pioneers in the doors (back doors off deck power). Amazed the speakers are still good. This amp spoiled me. I've tried a handful of newer amps and been disappointed. The only one I liked (in my cheap price range) was the Power Acoustik BAMF-1600/4 I put in my Civic wagon. It stayed in the car when I sold it. I also have a NIB Viper 1100.5 amp in the garage I bought for a car I wrecked before I got the amp into it. My house is my work shop, so it's my go to for listening to music. Have the whole internet worth of entertainment at my finger tips =). Wish I had a garage to work in, but that will happen some day down the road. I've never heard a surround sound system I liked, give me 4 way any day or 4 way + a sub is great too if the 4 ways can't do the sub woofer range. My dad's system was a 4 way, his rear two speakers have the foam failing so he disabled them for now. The front speakers are 8ft tall and he built them right into the walls. Woofer + sub + 2x mids + 2x tweeters. He just needs a choke and maybe a dedicated amp channel for the sub since it gets the full woofer frequency. My tv is some old 62in, was a garbage picked one that I repaired (recap on power supply). It's not perfect but works, no base so it's hung on the wall. I was running a 32in LCD screen intended for a computer which has a better picture (contract ratio), but it's a bit too small to read text on youtube and such while sitting down. The 62 is just big enough to read the text. I'm probably spoiled a bit on audio quality, I grew up most of my life with a $2500 amp/stereo setup + those home built speakers. The amp competes with the low part of the high end units that typically were around $5k or so. These are 1990ish prices, no clue what today prices would be, probably similar or a little less because of newer tech. I love the old raw power amps though (huge transformer, 50lb amp etc). Tiny pic, but here's the inside of the amp, its basically all transformer, caps, and heat sink (passively cooled no fans). Anyway, if you're happy with the audio quality you have, stick with what you have, no point in throwing down $5k on a system if you don't need/want it. I've been building my system up since I was like 12 and getting everything cheap. Most expensive thing was the amp $400 used. Main two speakers + another stereo was $300 and is a steal, they go for $600 or so for just the speakers now. Sub was $200 used, should have spent the $250 on the higher wattage one, but it suits my needs until I start pushing my little $20 100w stereo lol. My eye's are on that Yamaha amp which runs $1000 used to properly drive the mains, and I have to research a good pre-amp probably in the $500ish range. I have a hard time buying new electronics, too many things going to cheap china crap. Around mid 1990's and older didn't have the major capacitor problems that we see today. Anyway, to get back on topic, that write up for lean vs rich is worded well, most of it I knew, but couldn't think on how to translate it into words. Pretty interesting so many machines go to such larger pilots. I wonder what the elevation is like for those installs? I'm around 650-700ft above sea level. I took too long to reply lol, another reply got in . I think HiFonics was known as a higher end brand. 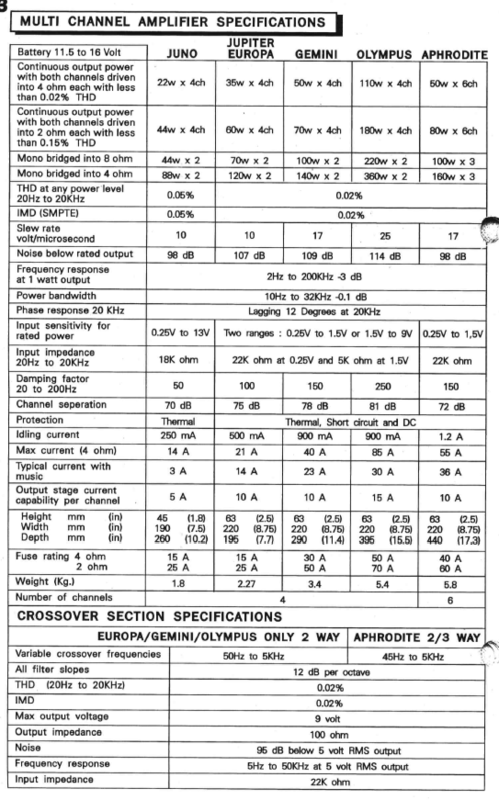 Looking at the specs in a owner's manual thing I found on them, looks like into 4 ohm speakers, the distortion (THD) is 0.02%, 2 ohms and lower it's 0.1% and up. Looks like it's 35W per channel RMS into 4 ohm. It says Mono bridged is 120w per channel into 4 ohm, seems like the amp was designed to be basically a 2 channel bridged unit for max power output. It has a great low end frequency response, great distortion rating, and enough power for a car system to get pretty loud and still sound great. Not everything is about pure wattage, I'm sure it creates great sounding music for within the limits of being in a vehicle. This is the kind of specs I like to see, gives the details of real quality vs wattage etc. Most cheaper amps I've seen are atleast 0.1% THD, the Crown amp I was using to push my subs was rated 0.1% but I was going for the raw power anyway. I can't find the THD spec for the internal amp in my 15in sub box. It sounds good till I start really pushing it, then it gets the subwoofer boom noise that I don't like. Last edited by ps2fixer; 01-10-2019 at 06:32 PM. 67 chevelle, very nice ride. Have a friend that has a 67 chevelle, and 67 covertible rs camaro. The chevelle is black on black, 396 a beautiful machine. One of my favs. isn't it funny we all share similiar interests, cars, trikes, stereo's. Small world. On the way out to the shop, pull the carb, and put in the 45 pilot. See what happens. GL on the pilot upgrade. I'm just the odd duck here because I'm into computers and electronics too, but I'm pretty young as well lol. No real experience with the Chevelle's, but in the 90's the family car was a 1972 Oldsmobile Cutlass with a 350 rocket, it was rusty, dinged up door, no key needed to start kind of car lol. My dad was a huge oldsmobile fan, he put the 350 and 455's in a lot of vehicles, even converted a diesel 350 into a gas 350 which wouldn't turn off after it came up to temp. He still has some engines, transmissions, and a bunch of misc parts from oldsmobiles from that era. He even has some legit 442 parts from a Hurst olds 442. I remember them having monster torque, but not much else (he owned a lot of them for parts etc). So had a weird thing happen. Swapped the 42 for the 45 and it fired up. For maybe the first 2 minutes When I gave it the throttle I could see the extra fuel smoke coming from the exhaust when I revved it. It was at the lower throttle disappears up high. After it warmed up it disappeared around 5 minutes. I played with the setting after I got it to idle and would still get the delay in rpm's coming down. A short one. However the idle adjustment screw on the right side of the carb is very sensitive. It seems that its idling high, then a slight turn counter clockwise and the rpms go down, but almost to the point the engine dies, then it does. So I am still investigating. Just wonder why it smoked for the first minute or so when revved. It was fuel smoke, not oil. I think I may have to go up again. When turning the fuel screw out I started at 1.5 turns base setting. I could go past 3 again, so I guess I am going to a 48 next, then if that doesn't do it, the 50 or 52. Soi haven't messed with the carb today. Had too much going on. But I did receive some new parts. I got an oem metal gas tank that came off a 1984 model 200x, outside is in good condition, paint scuffs but no dents, and the inside looks brand new, no rust, and looks as if it never had gas in it. So what I am gonna do is I have a local business that powder coats, so I am gonna getbthem to sand blast it, then powder coat it gloss white, which should be better against fuels, and wear. Should give it the original looks too. I already have the 1985 200x red white and blue tank stickers for it. So then everything will look new. I also got in a reproduction decal for the rear fender that goes across the tail with 200x in the center, as the originals did. It looks good up there. Tomorrow the new gas valve and handlebar grips should be here. I plan to replace the original handlebars with renthals as well. I am also thinking of buying a set of maier larger shrouds for the tank, to match the rest of the plastic. So thats where I am so far. Still testing the carb with pilots. The 45 seems to be about the same as the 42, still getting that pause in reduction of rpms when letting off the throttle. Have not tried the 48 or 50. But I really am thinking that I need to upgrade to the mikuni vm28 round or flatside carb. Then put a 130 main and 40 pilot and see where I am. I have an adapter that will bolt up to the head that was used on the original vm28 it had on it years ago. However don't really know the best way to keep using the oem air hose with out cutting it. Gonna explore and hopefully come up with a solution. Gas tank is now at the powder coaters to get refinished in gloss white. Ran $150 for it to be blasted down, primered and powder coated, 2 week wait, but it should look good when I get it back. Then the original 1985 red white and blue tank decals along with the new warning decal, and new gas valve, should be better than new. I will post a picture when I get it back. Well it got some new shoes. Kenda kutters 20x11-9 on a spare set of DID aluminums I had. Brake line should be here today. And the powder coaters called can pick up the gas tank this week.